Greetings everyone. It is time for another "Team Tuesday", and, it is also Autumn, my favourite time of the year. 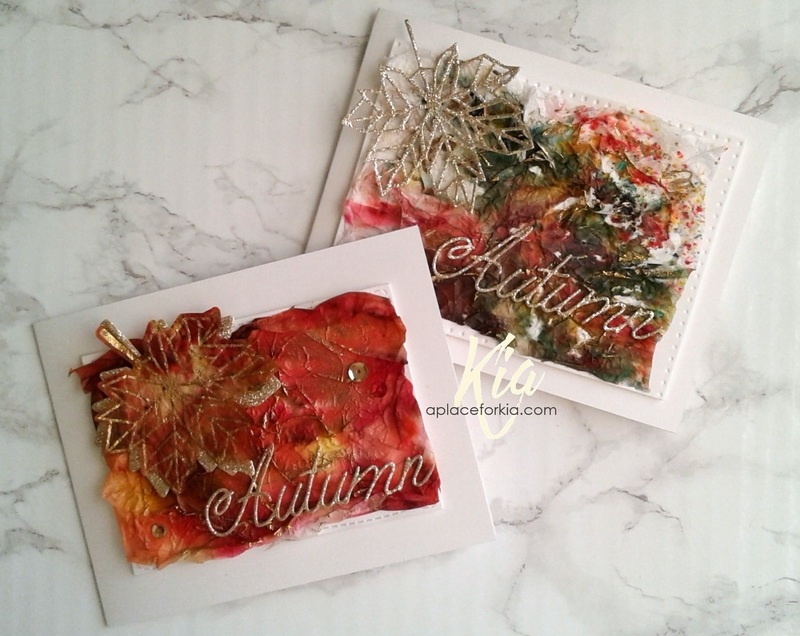 So, to celebrate I have done a few Autumn cards using tissue paper along with Paper Artsy Infusions and Bister Powders. If you are not familiar with these powders, both brands are a water soluble stain which have dye colour pigment mixed with walnut stain, and they make for some fabulous backgrounds. I have used both powders on my cards today, along with tissue paper and embossing powders. My Misti plays a big role in making these cards. I have added a video below walking through the steps of making the 4th card below, and how I used my Original Misti, Creative Corners and the new Bar Magnet in the process. The stamp and die sets that I have used throughout are from Neat and Tangled and called Maple Thanks. 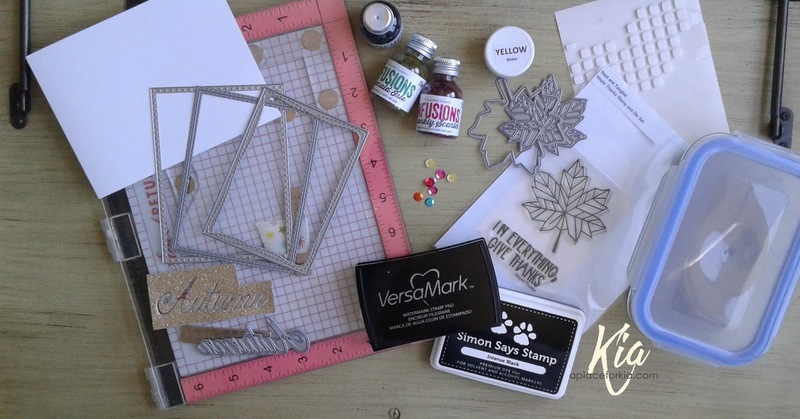 The rectangle dies I have used are Sizzix Dotted Rectangles, Simon Says Stamp Stitched Rectangles and Simon Says Stamp Wonky Rectangles. These are the first two cards. The left is done using Paper Artsy Infusions Frankly Scarlet and Bister Yellow. The right card is done using Infusions Frankly Scarlet, Green Man and Bister Yellow. For both cards, the panel is attached on foam tape, and the embossing is done in gold. 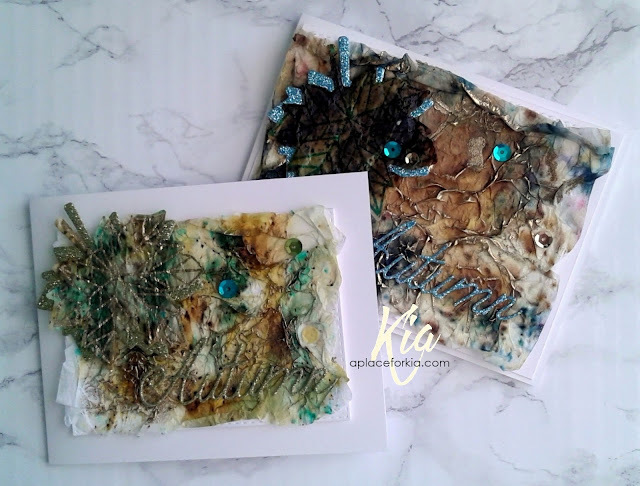 For these 2 cards, on the left, Infusions Emerald Isle and Bister Yellow, and the right card is done using Infusions Sleight Blue and Bister Yellow. To peak your curiosity, here is a picture showing almost all of the products that I used for these cards. A few things are missing, such as the Clear Embossing Powder and a couple of the Martha Stewart Glitter Markers that I used to colour the leaves inside the cards, along with the Tim Holtz Distress Peacock Feathers Ink. And, following is the video link. I hope you enjoy the video and that you too will feel compelled to create using the Tissue Paper Watercolour Technique. My inspiration for the Tissue Paper Watercolour came from Loll Thompson. You can find a link to her video on my blog under Awesome Tutorials here. Thank you for joining me today for Team Tuesday - have yourself a MISTI creating day. GORGEOUS CARDS, I love tissue paper! Great creations!! I love the texture. Super fun ... awesome cards. These are great creations !! I love when there's some texture. very pretty, great color combinations! Many halls are created to provide a catering service to specific cultural needs. And it gets very difficult to have a party at a hotel because the catering staff could not cook the traditional meals required by the client. But this Chicago event space specialize in specific cultural needs. Wow, these are gorgeous! I miss your talent! These are very interesting cards, the texture is awesome !